Project Audit Trail for a specific result? How to print Project Audit Trail for a specific result? It would be nice to use a report template for this. Depending upon your version of Empower... pull the results into review and check out the Result Audit Viewer. I believe this tool was introduced in either FR2 or FR3 for Empower 3 only. You can template your own reports as well. Just include the information you are interested in and what summary type you want to use (injection, vial, or all). Unfortunately, we run FR1 of Empower 3. Can you provide an example how to create report? Or that only for FR2 or FR3 too? 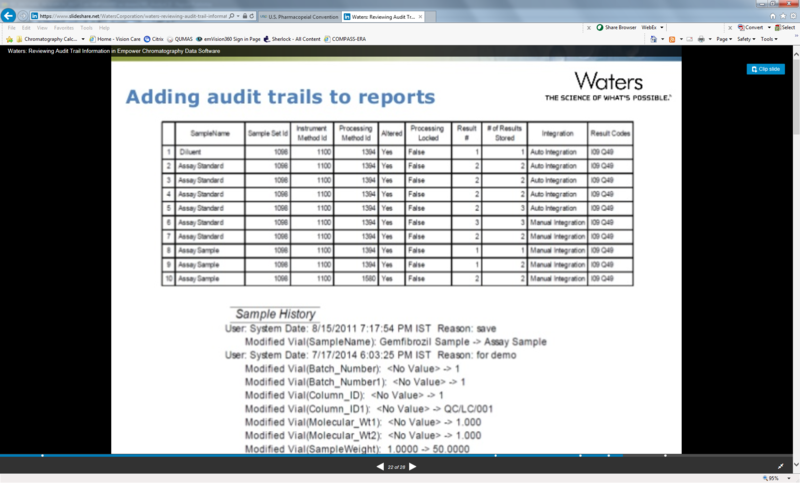 Attached is an example from a Waters' electronic data integrity webinar. Just create a report with a table in it and add the fields you desire. I just wonder about the field "Integration" is that a Custom Field or were do I find it? Also the "Sample History" seems to have more information than I can get.